If your family is recently arrived in Saudi Arabia and you are planning to Issue Family Iqama (dependent’s Iqama) either wife or children, this can be achieved in following easy steps. Visit any authorized medical center or hospital and ask them to do a medical test of your dependents. Your dependents were already completed a set of medical test in home country, however once reached in Saudi Arabia, another medical test is also required. In case these medical test are also passed, there will be no problem for you to get family iqama for your wife or child. Once the test is completed authorized Hospital or Clinic will submit the report to MOI Online. It will hardly take 1-2 days. Once you are sure the medical result is online, visit Jawazaat office which is authorized to issue new family iqama. Normally it is one dedicated Jawazaat office in each city for doing this. In Jeddah City it is located in Al-Rehab Dist (حي الرهاب). You can obtain MOI form from the internet and fill it by yourself, however I recommend it to get it filled by an agent. Various agents are sitting outside Jawazaat office on the road. 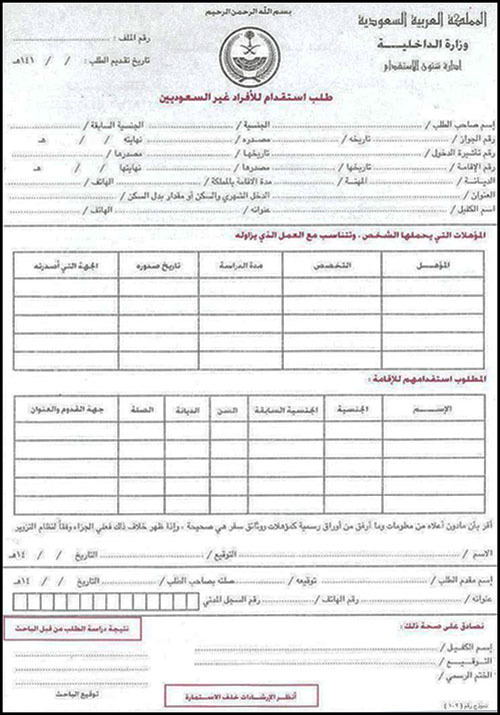 They charge SR 10 for filling 1 form. Once the form is filled, go to Jawazaat building. You may ask the exact hall where new Iqama is issued from the officer at receptionist in case you didn’t find a point arrow or mini-board. Once you reach in the hall, get a ticket and submit your documents upon your turn. The officer might ask you for original Iqama. Also they can retrieve information through Air-port entry number. It will take maximum 2 to 5 minutes and Family Iqama for your dependents will be printed. If you require Degree attestation in your home country by Saudi Embassy / Consulate, you will be asked for a Letter from your Sponsor – Employer in Saudi Arabia To Saudi Embassy – Consulate in your home country. Normally the contents of this letter are… You are an employee working with the employer and employer has no objection if Saudi Consulate attest your documents. However the letter is written in Arabic language as the official language for communication with Saudi Embassy is Arabic. Also the letter must be attested by Chamber of Commerce in Saudi Arabia to make sure the official signature and stamp is real and not fake. Mostly expat employee don’t know how to explain their sponsor to issue such a letter for Saudi Embassy and when they request such a letter, even employers don’t have any idea, what the employee is actually looking for. Upon so many requests, I am presenting a sample letter that an employee can copy and ask his / her sponsor to issue him such a letter. Please note that it is a sample letter and you need to change its contents to match the original content as per your bio-data. For instance the following details. Line 1: Issue No / Serial No (This would be an auto-generated number that a a company keeps for its records, this is not mandatory). Line 2 and 3: Issue Date in Gregorian and Hijri Calendar. Line 5: Location of Embassy – Consulate (City + Country). Line 8: Name of Employee as written on Iqama + Nationality of employee. Line 16: Name of your sponsor / employer + his signature. 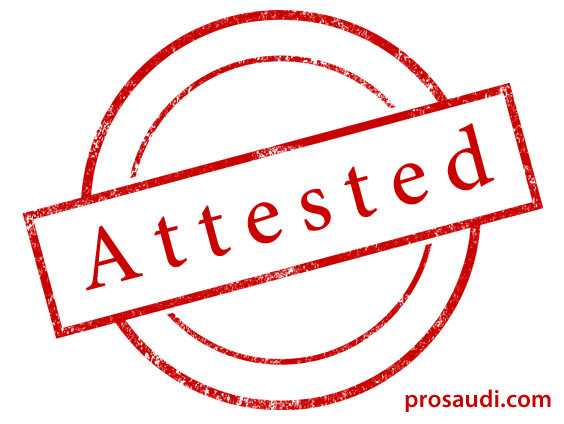 Ending: Employer / Sponsor’s official stamp (Must be attested by Chamber of Commerce). To Download this letter in Ms Word, please share this post from buttons below and the Link will appear after sharing to any single social network. 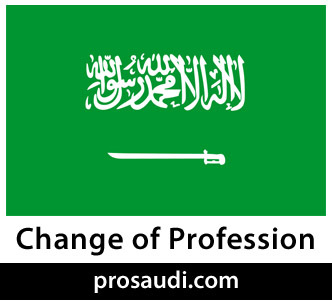 Changing your Profession in Saudi Arabia doesn’t mean to leave your existing job and do something else but it means to change the profession that is mentioned on your Work Permit or Iqama. Why do someone want to change it? because it has huge impact on benefits and facilities you get in Saudi Arabia being a foreign worker. Including ability to apply for a Family Visa for yourself. To Change Profession mentioned in your work permit you got to fulfill some requirements and rules. As per Saudi Arabian Ministry of labor you must be doing a technical job and earning a good lively hood to support your family in the Kingdom. That’s why labors and general staff are not entitled to apply for a family visa. If an expatriate want to call his family on resident visa he must belong to a professional or technical job and his/her work permit should also state that. Every expatriate in Saudi Arabia has an Iqama (Resident permit) which states his profession. If an expatriate is living in Saudi Arabia and his profession is not eligible for applying for a family visa he got an option to change his profession in his/her work permit. This doesn’t mean he has to change his job, but this is just like a requirement in documents. Once you have done Documents attestation from Saudi Consulate in your home country, bring your documents in Saudi Arabia and attest again from following. Your company / sponsor must issue a letter that you are an employee to them and doing same kind of work as per your qualification and degree and also you are intended to change your profession as per same work. Now translate your degree into Arabic from an approved Translation Center in Saudi Arabia. Once your profession is changed to a suitable profession you may apply for a family visa anytime. Further process is very simple that I will explain later. To change your Profession in your Saudi Work Permit or Iqama, you must have a valid University degree or a 3 years technical diploma which is attested by Saudi Consulate in your home country and Ministry of Foreign Affairs in your home country. To attest your degree you must have gone through the following process. This is a Prerequisite to Changing Profession in Saudi Arabia. 1. Request a Letter from your Company; to Saudi Consulate for Attesting your Degree / Diploma. If you are already present in Saudi Arabia, You need a letter from your Company/Sponsor to Saudi Consulate in your home country. The Letter should state that you are having an Iqama and working in Saudi Arabia and company has no objection if Saudi Embassy will attest your degree, then attest this letter from chamber of commerce in Saudi Arabia. Soon I will post a snapshot of this letter. However if you are not present in Saudi Arabia or you didn’t reach Saudi Arabia yet, request such a letter from your employer via email or telephone and ask them to send original copy of the letter via Postal Service. Once you received such a letter, gather below documents in one file. Now move to step 3. The next steps should be done in your home country. 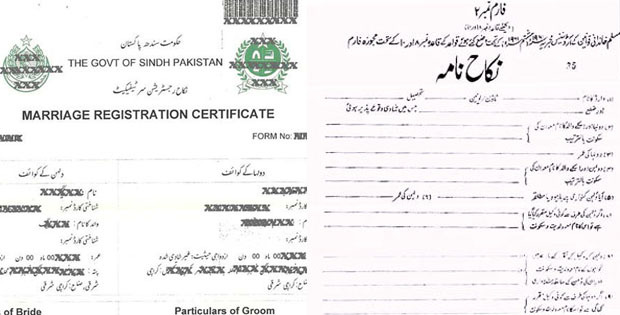 Before submitting it for attestation from Saudi Embassy / Consulate get your degree attested by yourself from following offices. Contact any recruiting agency, travel agency or agent who is specialized for dealing with Consulate of Saudi Arabia in your home country. Almost all the agents who arrange Umrah Visas can help you in attesting your documents. Make sure to attest degree from following. In Pakistan all these offices are located in Islamabad. Please note that you can’t go to embassy yourself for this work, you should find an agent who is approved by Saudi Consulate to do this. This is the website of one of the agents doing this. Expats community in Saudi Arabia is seeking and requesting information and required Forms for applying Family Visa in Saudi Arabia. So I decided I will try to put this info at my blog to make it available for the expats community. If you don’t know which documents are required and what is the procedure for getting family visa then I have compiled this post for you. Read it fully to understand family visa step by step process. How to Get a Family Visa in Saudi Arabia. Family Visa in Saudi Arabia requires a suitable profession, if your profession is not eligible for family visa you can read here how to change your profession in Saudi Arabia. Click Here to Download Family Visa Application form in Ms Word. The form look like this. You have to fill this form and collect other required documents and visit Istikdam office.